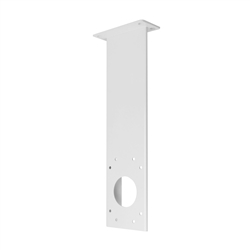 Ceiling Mount (BR-CM1) - A ceiling mount that lets you install a security camera anywhere. Introducing the universal Ceiling Mount for all D2, D3, and S-Type camera housings. When you need to mount a security camera and there is no wall to be found or when the wall is not where you want to mount the camera. Dotworkz KT-MIC easy to install outdoor audio option for all	cameras analog and network based. Directional and adjustable to optimize pick up. Durable waterproof and UV protected. Works in both indoor and outdoor applications. Acoustic backdrop for long range boundary operations. Single cable install no power source needed works on standard 3mm mic input. Dotworkz EZ Lock Pole Mount Adapter is a feature rich mounting adapter. Easily secures to poles with a minimum of ¾” diameter. 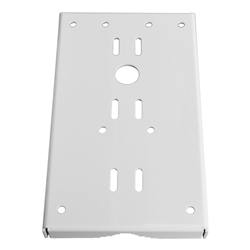 An Angle Correction Plate can be added to correct the angle of the enclosure up to 10 degrees for non plum poles, it also has Component Attachment antenna mounts for adding additional Omni or yogi antennas. BR-Q60-E is the Axis Q60 Integration Pro Kit from Dotworkz, for D2 & D3 Housing enables indoor and outdoor versions of Axis Q60 & Q60-E series cameras to be installed into D-Series Housings. Ideal for full integration of many accessories in a single camera housing, such as PoE Injectors or Switches, Mesh or Cellular Radio’s, combined with NVR’s, Network switches, and fiber converters all inside the same housing. Dotworkz is excited to release the Nano Mount kit (KT-UBNT-NANO) for all our D Series outdoor camera housings. Engineered for an easy, safe, and professional installation of all Ubiquiti PowerBeam M Series and NanoStation M Series wireless antennas. This new Nano Mount provides the ideal DIY solution in mounting any PowerBeam or NanoStation radio antenna directly onto the D Series security camera housing without compromising the housing itself. This Adapter is used to correct or change angles of the enclosure when mounted to a pole in conjunction with the Dotworkz EZ Lock BR-MPM1 Pole Mount Extended Pack (BR-MPM2) Dotworkz KT-AV8000 Arecont AV Camera Lens Kit for integrating the Arecont AV 8185DN, AV 8365DN, AV 20185DN and AV 20365DN cameras to Dotworkz D2 and D3 enclosures. Dotworkz KT-AV2000 Arecont AV Camera Lens Kit for integrating the Arecont AV 8185DN, AV 8365DN, AV 20185DN and AV 20365DN cameras to Dotworkz D2 and D3 enclosures. 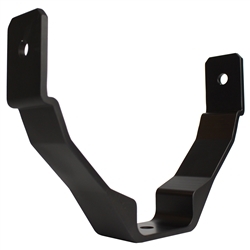 Angle Correction Plate for Pole Mount Extended Pack (BR-MPM2-AC) Dotworkz BR-ACC-50 Custom Internal Accessory Component Mounting Plate. The Dotworkz Custom Internal Accessory Component Mounting Plate (BR-ACC50) was originally designed for Panasonic Analog and Network Cameras including broadcast electronics to be mounted inside the D2 or D3 Dotworkz Camera Enclosures. Dotworkz FireTide Mesh Radio Conversion Kit The corner adapter designed to work with the Dotworkz D Series housings. The PSA1 is designed to to the inside or outside of a parapet wall. The arm swings 360 degrees and can be locked in several positions. The swing arm can be rotated ack to the roof for easy servicing of the enclosure. There is an additional mounting plate at the base to attach accessory components. The PSA1 is compatible with the Dotworkz D2 which can attach directly to the mounting face plate. The Dotworkz BR-CPM1 Compact Parapet Mount Bracket is designed to be used on roof top parapets. The CPM1 flat mount surface is compatible with all Dotworkz D-Series. This 5 Port Ethernet Switch Kit is the best solution for adding more network ports inside the Dotworkz D2 or D3 camera housings. The 5 Port Ethernet Switch Kit (KT-HUB5) mounts securely inside all Dotworkz D2 or D3 camera housings. This PoE Injector 12v Input 24 Watt with Acc Tray is the best solution for adding a 12v input 24 watt PoE injector inside the Dotworkz D2 or D3 camera housings. The PoE Injector 12v Input 24 Watt with Acc Tray (KT-POE-24) mounts securely inside all Dotworkz D2 or D3 camera housings. This PoE Injector 12v Input 35 Watt with Acc Tray is the best solution for adding a 12v input 35 watt PoE injector inside the Dotworkz D2 or D3 camera housings. The PoE Injector 12v Input 35 Watt with Acc Tray (KT-POE-24) mounts securely inside all Dotworkz D2 or D3 camera housings. 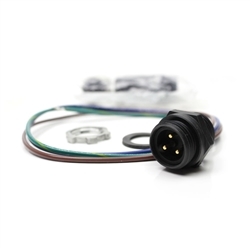 This Quick Connect Power Connector is the best solution for adding a quick release or quick disconnect directly on the outside of a Dotworkz D2 or D3 camera housings. The Quick Connect Power Connector to D2/D3 Enclosures (KT-PWR-QC) mounts securely on the outside of all Dotworkz D2 or D3 camera housings. This Axis Q60 Standoff Extension Pack is the best solution for adding space between the Axis Q60 camera mounted inside a Dotworkz D2 or D3 camera housings. The Axis Q60 Standoff Extension Pack (KT-Q60-SPCR) mounts securely on the internal camera bracket inside of all Dotworkz D2 or D3 camera housings. This Quick Connect Power/Ethernet Connector is the best solution for adding a quick release or quick disconnects directly on the outside of a Dotworkz D2 or D3 camera housings. The Quick Connect Power/Ethernet Connectors to D2/D3 Enclosures (KT-QCSET) mounts securely on the outside of all Dotworkz D2 or D3 camera housings. This Quick Connect Ethernet Connector is the best solution for adding an ethernet quick release or quick disconnects directly on the outside of a Dotworkz D2 or D3 camera housings. The Quick Connect Ethernet Connectors to D2/D3 Enclosures (KT-RJ45-QC) mounts securely on the outside of all Dotworkz D2 or D3 camera housings. The D2 Cooldome 12v Outdoor Power Pack Pole Mount Kit and Back Bracket (KT-CDR-2-AC) mounts securely to any pole diameter providing angle correction for any d2 camera housing. This Power Step Up Kit for 12V DC TO 24V DC is the best solution for stepping up the 12v DV to 24v DC and mounts inside a Dotworkz D2 or D3 camera housings. The Power Step Up Kit 12V DC TO 24V DC (KT-SU-24) mounts securely inside all Dotworkz D2 or D3 camera housings. Dotworkz D2/D3 External Component Rear Bracket. 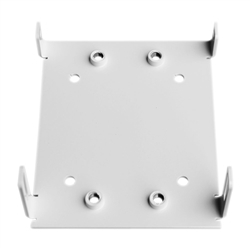 Bracket attaches to rear mounting pattern of the D2/D3 enclosures. Used for external components such as the Strobe Light. Replacement Tilt Plate for the Angle Correction Pole Mount (BR-ACPM). Angle Correction Pole Mount Kit Extended & Tilt Plate (BR-ACPM2).